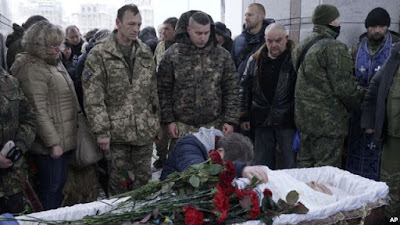 PENTAGON, Washington -- More than 400 Ukrainian troops have died in fighting since the Minsk II cease-fire agreement was adopted one year ago, with Russia playing a major role in the violence. Fellow Ukrainian government soldiers and mourners bid farewell to Oleksandr Ilnitsky, who was shot dead by a pro-Russian rebel sniper in Ukraine's eastern Donetsk region, during a service in Kyiv's Independence Square, Jan. 11, 2016. In an interview with VOA, Deputy Assistant Secretary of Defense Michael Carpenter, whose responsibilities include Ukraine, Russia and Eurasia, said the U.S. has seen a “considerable” uptick in fighting in eastern Ukraine. Despite last year’s cease-fire agreement, he said, Ukraine’s armed forces have suffered at least 430 fatalities during fighting with separatists there. “Russia maintains command-and-control links over the separatists that it backs over in eastern Ukraine,” Carpenter told VOA. “This is a Russia-fostered problem,” Carpenter said. Russian-backed separatists have carried out hundreds of attacks in eastern Ukraine in the last week. Speaking to the Senate Armed Services Committee on Tuesday, General Philip Breedlove, the head of the U.S. European Command, said there had been 71 attacks in the previous 24 hours and about 450 attacks in the seven days prior to that. Breedlove, who is also NATO’s top military commander, told reporters at the Pentagon that “disturbing trends” had formed, noting attacks in places that had previously been quiet and weapons being used that were supposed to have been banned. Despite these trends, and recommendations from Breedlove that include providing lethal weapons to Ukrainian forces, the Obama administration has not yet included lethal aid in its supplies to Ukraine. “We have calculated from the beginning that the solution to the conflict in the Donbass is not on the battlefield, but is precisely through diplomatic and economic, meaning sanctions pressure,” Carpenter told VOA. Speaking at the Senate hearing Tuesday, Republican Senator Kelly Ayotte slammed the administration for not providing lethal aid. “There’s a real urgency here. We’ve got an issue with Russia,” Ayotte said. The uptick in violence comes as officials warned more resources are needed to counter Russian aggression. “EUCOM [U.S. European Command] does not yet have the personnel, equipment and resources necessary to carry out its ongoing mission,” Breedlove told lawmakers. He added the new fiscal 2017 budget request of $3.4 billion for the military’s so-called European Reassurance Initiative would help close some of the gaps in U.S resources and posture in Europe. Even with the ERI, however, many gaps will remain, including in maritime efforts. Breedlove warned that Russia is testing sophisticated submarines in the Atlantic between Britain, Iceland and Greenland, and Carpenter acknowledged that the U.S. has had a “very low level of maritime force posture” in both the Black Sea and the Baltic Sea. “It's something that we need to address, I think, over time,” Carpenter told VOA.